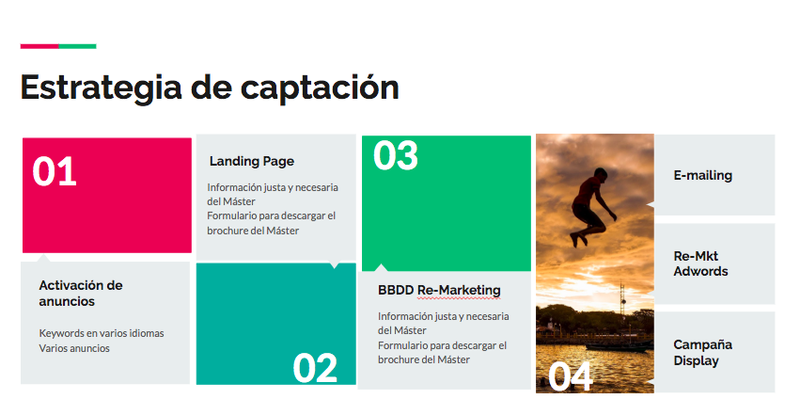 We collaborated with Lucía Brotons to generate traffic and web conversion. Creating a strategy and running the implementation on the Adwords platform for two international master’s degrees taught at the Carlos III Institute – Juan March (IC3JM), associated with the Carlos III University of Madrid (UC3M). The IC3JM needs an effective advertising campaign to publish and get students for the 2018/19 academic year in the two specialized masters in the field of social and political sciences offered. The masters offered, especially the “Master in Social Science” is a highly specialized and innovative education that do not have a high demand. Having very few masters and postgraduates that offer such specific training, the main challenge that we face goes beyond highlighting IC3JM over the competition. Therefore, the main objective is to find the market niche and target audience to position the university service. After the analysis, we performed the keywords, ads, and audience optimization to improve the campaign CTR. Set campaigns in the search network, audiences, keywords, ads, bids and site links. After many coffees and working hours, the campaigns were live recently, and we can proudly say that we have already achieved around 300 clicks and 4 conversions on the website in just two weeks. Now with the continuous optimization we will improve day by day and help the admissions team of the IC3JM to achieve their goal of filling the classes with the best prepared students.